This should be easy, but Apple make it hard. I have a MacBook Pro. 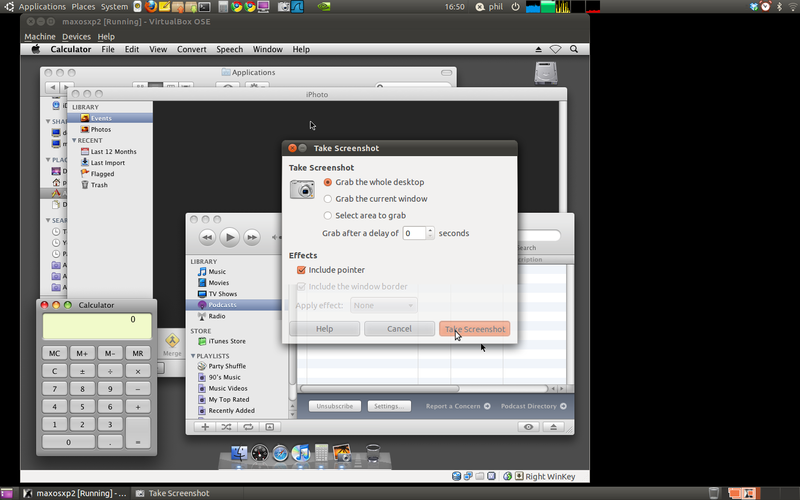 I have OS-X Leopard 10.5.2 installed as well as Ubuntu 10.10 linux. I wanted to get my OS-X partition to run as a virtual machine. After many false starts I got something to work. Hardware: MacBook Pro 4,1, early 2008, 2.4GHz, 200GB, 15"
1. Get VirtualBox to list the physical partition in the Virtual Media Manager. Please proceed at your own risk. Only do this if you have backed-up your disk partitions (with Time Machine for example, but don't forget about your linux partition) or your don't care about any data on your disk. I used this information to create my VMM vmdk file. In my case, my hard drive is /dev/sda under linux. Oracle VM VirtualBox Command Line Management Interface Version 3.2.8_OSE(C) 2005-2010 Oracle CorporationAll rights reserved. The OS-X partition in my case is number 3. It is about 23GB. RAW host disk access VMDK file /home/phil/.VirtualBox/HardDisks/example.vmdk created successfully. Now if you run Virtual Media Manager, you should now see a new hard drive entry for your physical partition. That wasn't that hard, thanks to Sun/Innotek for making this easy. The rest are the current defaults (which I will list below). I also enabled 3D acceleration, but I can pick either. Apple OS-X checks to see if a special key is in a chip. VMs don't currently emulate this chip with the key, so you need to get the key off your machine and add it manually to the VirtualBox XML file that describes the VM. The key is really a plea from Apple to not steal their OS. Here is their EULA for 10.5.
computer at a time, and you may not make the Apple Software available over a network where it could be used by multiple computers at the same time. I think this complies: One licensed and installed copy of OS-X on an Apple-labeled computer. I can't run it twice because that would do bad things to the file system. As you can see, the whole configuration of a VM is, more-or-less, understandable. But wait! To do the next bit, you have to run the VM once. Until you do this scary thing, the XML file is missing bits that make the next part easier. So, start the VM. When you see lots of text you can close the window and shutdown the VM. This is all safe it seems. Let me know if it worked for you, and if you have a different hardware, host, guest configuration. If it didn't work, then I probably can't help - but you you want me to explain anything that I did in more detail then please ask. BTW, if this kills you disk, damages your data, or generally make your life a misery then you will recall that I warned you, right?